Viral videos of Dogs are actually a treat to watch! The good boys can make videos go viral in no time. The most recent good boy going viral is a dog attending the Keertan and it is probably the best thing you will watch today. Dogs are probably the best creatures in the world that don't just look like cuteness overflowing. The cute dog from Pune has been flooded by love on the Internet. 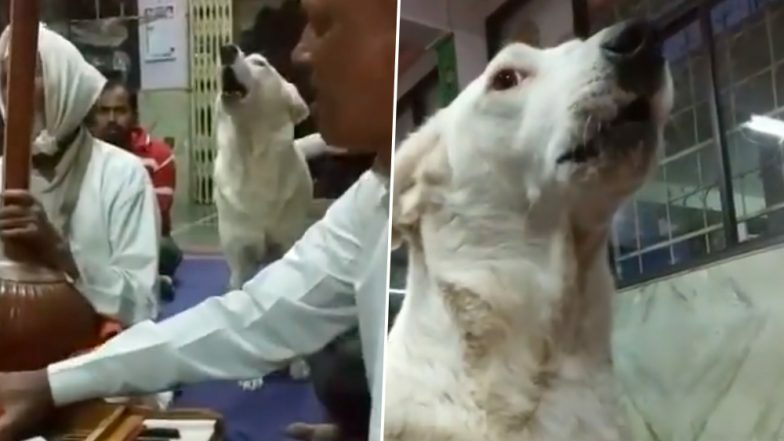 The beautiful video was shared by a Twitter user that goes by the handle name @sudhmadate shared the video of the dog attending a keertan(which is a musical prayer offered to the Gods.) The video is going viral on Facebook, Twitter and WhatsApp wherein you can see this dog carefully attending the keertan like the cutest boy ever. The dog belonged to the friend of the person who shared the video. The adorable video was shared with the caption: "This devoted dog belongs to my friend's factory. Every Thursday night, without fail, walk to the temple next door and join the keertan. Then he has his share of Prasad and jogs at home. Every Thursday!" In the video, you can see the cute dog singing along with the keertan singers as well. He also seems to love playing with the devotees in the temple. The video has gone viral online with over 4k likes and 1k retweets already. Why not! Everyone should see this video and their day will be made.